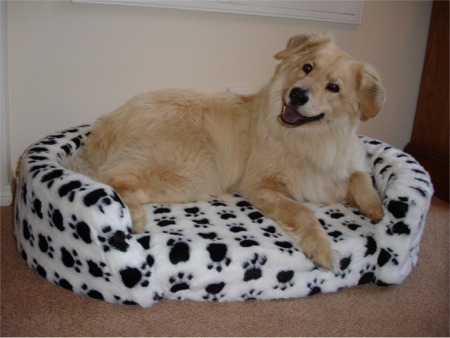 "Memory foam pet beds tested on humans!" Introducing the Pooch-Pedic™ and Kitty-Pedic™ luxury dog beds and cat beds that use specialty memory foam technology. At Pet-Pedic, we don't believe in any animal testing that we wouldn't perform on humans, and we do just that! 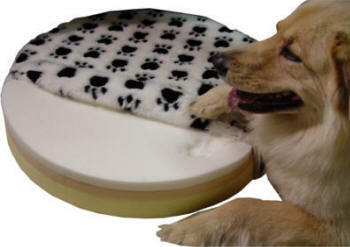 Our memory foam pet beds use the highest quality 4lb. and 5lb. memory foam, the same foam we use on our award winning top-of-the-line mattresses for humans. We first got the idea when owners of our award winning mattress called the Tri-Pedic started telling us that their normally restless dogs were sleeping through the night in the same position all night long, without all of the usual moving around on the bed. It gave us the idea to start a whole new line using our same high quality designs, but with a bit more flair! NASA created memory foam in the 1970s to help reduce the G-force astronauts went through when traveling into space, but since then it has been proven t o provide the most comfortable and supportive sleep by reducing pressure points with an even contouring of the whole body's imprint. Only our special design offers a 3-layer memory foam cushion effect that supports all body types by using a softer 4lb. memory foam over a firmer 5lb. memory foam layer. Experts agree that our memory foam pet beds really help your dog or cat sleep with the support they need and the comfort they crave. So, whether you are in the market for a cat bed or dog bed, you can rest assured that your pet will be sleeping on the best designed beds available for pet or human! Pet-Pedic and all associated material ™ Relief Mart, Inc.